Handsome image, Carin … sunrise or sunset? 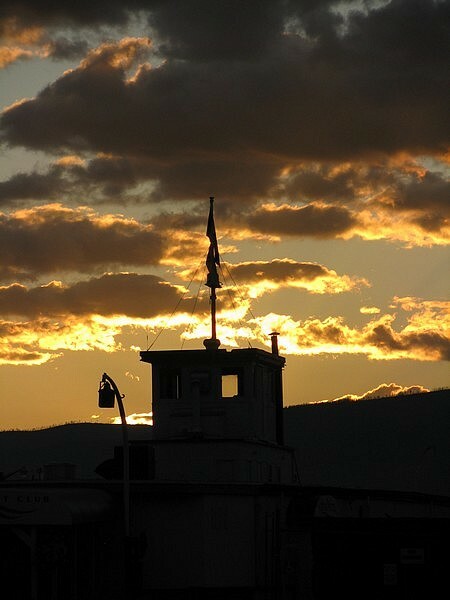 Love that golden glow kissing the dark clouds and staging the boat in silhouette. It’s even more striking when I viewed the image solo! Sunrise. And the jury’s out on whether it’s actually a boat. Elizabeth’s question put some doubt in my mind and it’s possible that it’s some kind of nautical building on a short pier. We travel to this area pretty regularly so I’ll have to investigate more closely next time. I took the shot for the sky and silhouette; I hardly cared what it was. But the area used to be home to houseboats so that was in my mind. Plus, I LOVE houseboats. So that’s what I see… in Rorschach kind of way. I love this photo! Gives me such an eerie feeling. Happy WW! I thought it was very mysterious but now see that someone else says it’s a boat. It looks like a building on the top of a cliff on my screen so I’m wondering if it’s not showing up quite right. It does look very intriguing and slightly ominous though, and with a beautiful light behind. If it is a boat, what kind of rigging is that?? Actually, I guess it’s not rigging at all but just stays for the flagpole now I look again. Oh, the black against the orange glow of the sunset is stunning! WHAT WHAT WHAT???? (I wanted to say.) Lovely, mysterious, and so hopeful-looking. Golden morning. And — if others are right about the nautical content — a lovely morning to head off on a watery adventure! Barbara, this shot was taken on the stretch of water near The Cove in Kelowna. Do you know it? That part of the lake used to be home to a fleet of houseboats not too long ago but on our last visit we noticed they’d gone. [All of them, I think, but not sure.] I remember there’d been some furor about them in the community. So this may not actually be a houseboat after all (so dark even I can hardly tell) but a sort of lighthouse (but not a lighthouse) thingy on the shore. I’ll admit I took the shot rather randomly and the silhouette and sky were more interesting to me than the ‘structure’. Anyway, if you happen to know that stretch of road/water, you may recognize this. I realize you’re in Penticton… but worth asking! Striking golden-lit sky and clouds. Sunrise? I think it’s intriguing that we can’t quite make out the structure and that it could be various things. I don’t think a boat … though I could be wrong. A watchtower of some sort? And what is it that’s hanging on a hook to the left? A lantern? Is there someone inside, and what is their purpose in being there? Another shot that provokes wonder and discussion, Carin. Lovely. Turns out it’s probably not a boat, though when I came across the photo I thought it was because I remembered taking it in an area (Kelowna) where several houseboats used to be moored. After some ‘curious’ comments I looked again and realized I’d taken it on a subsequent visit… I remember there’d been a kerfuffle about them and they’d been removed. Talk about prompting story. I like the way this one has evolved! Anyway, I think this may be part of a small yacht club (possibly one of the reasons there are no longer houseboats in the area…? ).